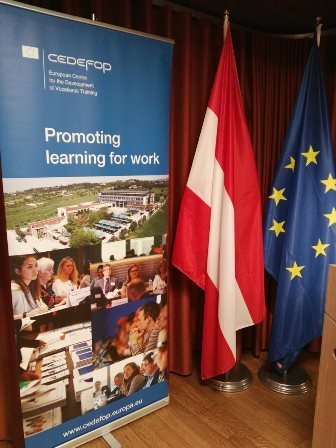 Cedefop, together with the Austrian Presidency of the Council of the EU, organised the 6th Cedefop Brussels-based seminar. These seminars, organised in cooperation with the rotating EU Presidencies, build on Cedefop research and analyses and address issues relevant to European debates on vocational education and training (VET) and employment. The 6th Brussels seminar presented Cedefop research-activities related to the future of VET. Cedefop experts, supported by national and international experts and stakeholders, presented and discussed future VET scenarios and their possible implications for policies and practises. This seminar provided an opportunity to reflect on the current and future role played by European VET in a time characterised by changing demographics, technologies and labour markets. Based on the extensive research carried out by Cedefop between 2015 and 2018, a set of scenarios was presented, pointing the possible directions VET may take in the coming decades. The purpose of the scenarios is not to predict the future, but rather to alert policy makers and stakeholders on main trends and the possible implications of their policy choices.